We have two current projects that are focusing on organic matter dynamics in lentic systems. One project is being conducted in the Big Thicket National Preserve and the other in Clear Creek, a north central Texas prairie stream. This research is funded in part by a National Science Foundation Grant and National Park Service grants. 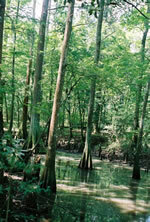 The Big Thicket National Preserve is faced with numerous potential private, state, and federal water development projects in the Neches River watershed. While dams have altered this river’s flow regime, it still continues to display a cyclic inundation and retreat of water to its floodplain. However, continued water development projects on the river will have the potential to change the already altered Neches River flows. Currently the relationship between the Neches River flow dynamics and its floodplain is only partly understood. The study will collect basic hydrologic data on portions of the Neches River and investigate the relationship between discharge and inundation on: vegetation dynamics, trophic pathways and invertebrate assemblages. Results of this study will help the NPS understand the relationships between the hydrological characteristics and the ecological dynamics in order to help ensure preservation of the biotic resources of the Big Thicket National Preserve. The aquatic ecology lab is studying the organic matter dynamics. These studies are being performed by Allison Stamatis as part of her doctoral research. Dr. Miguel Acevedo’s lab is performing the hydrological studies. 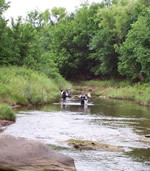 We have recently begun a similar study on Clear Creek a prairie stream in north central Texas. The study of aquatic insects is a central theme in the Aquatic Ecology Laboratory. We are particularly interested in understanding the life cycles, distributions, habitat relationships and the bioenergetics of aquatic insects. In the past we have focused on insects in the orders Ephemeroptera, Coleoptera, Trichoptera, and Diptera: Chironomidae. Papers that we have published in this area are listed below. Bolling, B.G., Kennedy, J.H. and Zimmerman, E.C. Seasonal Dynamics of Four Potential West Nile Vector Species in North Central Texas. Journal of Vector Ecology. (In press December 2005). Wang, B. and Kennedy, J.H. 2004. Life History of Mayatrichia ponta Ross (Trichoptera: Hydroptilidae) in Honey Creek, Oklahoma. Proceedings of the Entomological Society of Washington. 106(3):523 – 530. Balci, Pinar, and Kennedy, J.H. 2003. Estimation of Surface Areas of Myriophyllum spicatum and Heteranthera dubia. Journal of Aquatic Plant Management. 41: 119 - 125. Taylor, J.M. and Kennedy, J.H. 2003. Cohort dynamics of an overwintering Caenis latipennis population in Honey Creek, Oklahoma, U.S.A., pp 201 – 204. in Research Update on Ephemeroptera and Plecoptera. Edited by Elda Gaino. Proceedings of the of X International Conference on Ephemeroptera, Universita Di Perugia, Perugia, Italy. 488p. Kennedy, J.H. 2003. Contributions to the life history and knowledge of the ecology of mayflies (Ephemeroptera) from the New River, Virginia, pp 193 - 197. in Research Update on Ephemeroptera and Plecoptera. Edited by Elda Gaino. Proceedings of the of X International Conference on Ephemeroptera, Universita Di Perugia, Perugia, Italy. 488p. Johnson, Z. B. and Kennedy, J. H. 2003. Macroinvertebrate Assemblages of Submerged Woody Debris in the Elm Fork of the Trinity River, Texas. J. Freshwater Ecology 18(2): 187-197. Balci, P. and Kennedy, J.H. 2003. Comparison of Chironomids and Other Macroinvertebrates Associated with Myriophyllum spicatum and Heteranthera dubia. J. Freshwater Ecology 18(2): 235-247. Baumgardner, D.E. and Kennedy, J.H. 2000. Biodiversity of Mayflies (Insecta: Ephemeroptera) of the Kiamichi River Watershed, Oklahoma. Journal of the Kansas Entomological Society 72(3):273-281. Cook, R. E. and Kennedy, J. H. 2000. Biology and energetics of Tropisternus lateralis nimbatus(Say)(Coleoptera: Hydrophilidae) in a playa on the Southern High Plains of Texas. Annals of theEntomological Society of America 93(2):1-7. Kennedy, J. H., R. Cook, and G. M. Anderson. 1998. Diversity and temporal patterns of macroinvertebrates inhabiting Southern High Plains playas, pp. 121 - 137. In A. J. McComb and J. A. Davis [eds. ], Wetlands for the Future. Gleneagles Publishing. Adelaide, Australia. Waltz R. D., D.B. Baumgardner and J.H. Kennedy . 1998. Character Variability and a New Synonym of Acerpenna pygmaea (Ephemeroptera: Baetidae). Entomological News 109(4): 257 - 260. Baumgardner, D.E., Kennedy, J.H. and Henry, B.C., Jr. 1997. New and Additional Records of Texas Mayflies (Insecta: Ephemeroptera). Transaction of the American Entomological Society 123(1&2): 55-69. Waltz R. D., D.B. Baumgardner and J.H. Kennedy . 1996. Baetis intercalaris Biological Notes and Discussion. Entomological News 102(2):83-87. Another major theme in the aquatic ecology laboratory is biological monitoring. Our laboratory conducts many routine biological monitoring programs using benthic macroinvertebrates in area streams and rivers. We are also keenly interested in the use of constructed aquatic systems in ecotoxicological research. Much of our work over the past few years has focused on questions related to experimental design, statistical power, and taxonomic sufficiency as regards the influence of these attributes on our ability to detect impacts to aquatic ecosystems. Kennedy, J.H. T.W. LaPoint, Balci, P., Johnson, Z. and Stanley, J. 2002. Model Aquatic Ecosystems in Ecotoxicological Research: Considerations of Design, Implementation, and Analysis In: Handbook of Ecotoxicology. pp 45 - 75. R. Hoffman, B.A. Rattner, G.A. Burton, and J. Cairns (editors) Michigan: Lewis Publishers 1290 pp. Kennedy, J.H., L.P. Ammann, L.P., W.T. Waller. 2001. Some Statistical Problems Associated with Biological Assessment - Implications and Solutions. AWRA. Annual Spring Speciality Conference Proceedings.Warwick, J.J. [Ed] Water Quality Monitoring and Modeling. AWRA, Middleburg, VA. TPS-01-1 284pp. Allen, H. J., W.T. Waller, J.H. Kennedy, K.L. Dickson, M.F.Acevedo andL.P. Ammann. 2001. Real-Time Whole Organisms Biomonitoring - Deployment, Status, and Future. AWRA. Annual Spring SpecialityConference Proceedings. Warwick, J.J. [Ed] Water Quality Monitoring and Modeling. AWRA. Middleburg, VA. TPS-01-1 284pp. Kennedy, J.H., Ammann, L.P., Waller, W.T., Warren, J.E., Hosmer, A.J. Cairns, S.H., Johnson, P.C. and Graney, R.L. 1999. Using Statistical Power to Optimize Sensitivity of Analysis of Variance Designs for Microcosms and Mesocosms. Environmental Toxicology and Chemistry 18 (2): 113 - 117. Ammann, L.P., W.T. Waller, J.H. Kennedy, K.L. Dickson, F.L. Mayer, M. Lewis. 1997. Power, Sample Size and Taxonomic Sufficiency for Measures of Impacts in Aquatic Systems. Environmental Toxicology and Chemistry 16(11):2421-2431. Allen, H.J., W.T. Waller, M.F. Acevedo, E.L. Morgan, K.L. Dickson and J.H. Kennedy. 1996. Minimally Invasive Technique to Monitor Valve-Movement Behavior in Bivalves. Environmental Technology 17:501-507. Dickson, K.L., W.T. Waller, J.H. Kennedy, L.P. Ammann, R.Guinn, and T.J. Norberg-King.1996.Relationships between effluent toxicity, ambient toxicity, and receiving system impacts: Trinity River dechlorination case study. Chapter 10 In: Whole effluent toxicity testing: an evaluation of methods and prediction of receiving system impacts. D.R.Grothe, K.L. Dickson, and D.K. Reed-Judkins editors. SETAC Pellston Workshop on Whole Effluent Toxicity. SETAC Press, Pensacola FL 340 p.
Goven, A.J. and J.H. Kennedy. 1996. Environmental Pollution and Toxicity in Invertebrates:An Earthworm Model for immunotoxicology. in Advances in Comparative and Environmental Physiology,E.L. Cooper (editor). Springer-Verlag, Berlin & Heidelberg. Pp. 169-211. Kennedy, J. H., P.C. Johnson and Z. B. Johnson. 1995. Section IV. Multispecies Test Systems. The use of constructed or artificial ponds in simulated field studies. In: Ecological Toxicity Testing, Scale, Complexity, and Relevance. J. Cairns and B. R. Niederlehner (eds). Michigan: Lewis Publishers, pp. 149-167. Waller, W.T., M.F. Acevedo, E.L. Morgan, K.L. Dickson, J.H. Kennedy, L.P. Ammann, H.J.Allen, and P.R.Keating. 1995. Biological and Chemical Testing in Storm Water. Proceedings of Stormwater NPDES Related Monitoring Needs. Engineering Foundation Conference, Crested Butte, CO. American Society of Civil Engineers, N.Y., N.Y. 676pp. Kennedy, J.H., P.C. Johnson, and Z. Johnson. 1995. The Use of Surrogate Aquatic Ecosystems in Ecotoxicological Research. In: Handbook of Ecotoxicology. R. Hoffman (editor). Michigan:Lewis Publishers, pp 117 -162. Heath, Susan, W.A. Bennett, J.H. Kennedy and T.L. Beitinger. 1994. Heat and Cold Tolerance of the Fathead Minnow exposed to the Synthetic Pyrethroid Cyfluthrin. Canadian Journal of Fisheries and Aquatic Sciences 51: 437-440. Kennedy, J.H., P.C. Johnson and Z. Johnson. 1994. Sampling and Analysis Strategies for Measuring Biological Effects in Microcosms and Mesocosms. In: Freshwater Field Tests for Hazard Assessment of Chemicals. I.R. Hill, F. Heimbach, P. Leeuwangh and P. Matthiessen (eds). Michigan: Lewis Publishers,pp. 159-181. Johnson, P.C., J.H. Kennedy, R.G. Morris, F.E. Hambleton and R.L. Graney. 1994. Fate and Effects of Cyfluthrin (Pyrethroid Insecticide) in Pond Mesocosms and Concrete Microcosms. In:Ecological Risk Assessment. R.L. Graney, J.H. Kennedy and R.H. Rodgers (eds), Special Publication of Society of Environmental Toxicology and Chemistry, Michigan: Lewis Publishers, pp 337 - 395. Dickson, K.L., W.T. Waller, J.H. Kennedy and L.T. Ammann. 1992. Assessing Relationships Between Effluent Toxicity, Ambient Toxicity and Aquatic Community Responses. Env. Tox. and Chem.11:1307-1322. Hill, I.R., J.H. Kennedy and S.T. Hadfield. 1988. Assessment of the impact PP321 (Synthetic Pyrethroid)on aquatic ecosystem using 0.1 acre experiment ponds. Proceedings of the Brighton Conference, Brighton, England:309-318.